In California we have to jump though an extra hoop to purchase a handgun. 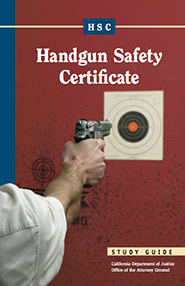 After you select your firearm you will need to obtain a Handgun Safety Certificate. It is a simple and relevant process, however it is also another stupid fee that no one should have to pay. While I agree firearm safety is an utterly important facet of firearm ownership, the test should be awarded free of charge. You give your FFL 25 bucks and they hand you a 30 question test. You must answer at least 23 questions correct to pass. While some questions require a bit of basic firearm knowledge, most of this safety test is absolute common sense. For example. "True or False. Discharging a firearm into the air is dangerous." With these common sense questions, just use your common sense. For other questions regarding integral parts, legal, transfers etc. you can download the study guide. If you are unfamiliar with the integral parts of a fiream click here. There will be questions about the anatomy of firearms on the HSC test, so study up. I am a huge advocate of firearm safety. I highly recommend that every person, newbie or not at least breeze though this guide. It is just good practice and good firearm safety. We need to educate ourselves and practice responsible firearm ownership. Your conduct is crucial and also the best way to educate others.